Product use:Post tensioned prestressed concrete structure，Coal mine support，High rise building，Underground garage，Concrete foundation construction projects such as foundation pit and tunnel. We produce steel strand and prestressed steel wire for high strength and low relaxation prestressed concrete. The steel strand once won the national product quality exemption, the top ten famous brands of China's steel strands, the construction of the best construction materials, the best construction materials in real estate development and many other honors, which are sold all over the country and applied to the construction of several key domestic projects and exported to the sea. Dozens of countries and regions have won favorable comments from customers both at home and abroad. Standard packing: Steel belt strapping, no shaft roll, PVC lining, moistureproof woven cloth, wooden support base.. Product performance: tensile strength 1770, 1860, 1960MPa, 1000h relaxation rate 1.0-2.5%. Applicable standards: national standard GB/T5224-2003, JG161-2004; American Standard ASTMA416-06; British standard BS5896-1980; European standard EN10138-3; daily standard JIS G 3536; Australian and New Zealand Standard AS/NZS4672.1:2007; Brazil standard ABNT NBR 7483. Tianjin Chun Peng prestressed steel strand Co., Ltd. was built in 1994. The company's headquarters is located in the northeast of the North China Plain, the lower reaches of Haihe River Basin, the center of the Bohai Bay, Bohai in the East, Yanshan in the north, near the city of Tianjin, around the Rongwu high speed, Beijing Shanghai high speed and Beijing Shanghai high iron ring, 35 kilometers from the largest artificial port, away from the sky. Tianjin Airport 35 kilometers of Jinghai County Daqiuzhuang Industrial Zone, the second branch is located 10 kilometers away from the Daqiuzhuang Industrial Zone Dongshuangtang Industrial Park.The company has registered capital of one hundred million yuan, covering an area of 48000 square meters and a building area of 16000 square meters. It is a joint-stock enterprise specializing in the production of prestressed concrete strand, unbonded steel strand and steel wire. The company has 278 employees, including 42 engineering and technical personnel and 46 management personnel. The company attaches great importance to the introduction of talents and talents. Through the introduction of various talents, the company has improved the comprehensive quality of the company, ensured the quality of the process and laid a solid foundation for the production of high quality products. The company adheres to the guiding principle of science and technology, guarantees the quality and production capacity, and pays attention to the efficiency policy. The company has established a perfect enterprise management system and quality management guarantee system, and now implements the ISO9001:2008 quality management system standard. The "Chun Peng" brand has won the trust of many customers with excellent quality and all-round services. In 2004~2010 years, it was awarded the title of "famous brand products of Tianjin city". From 2004 to 2007, it was awarded twice by the Municipal Industry and Commerce Bureau as a contract heavy credit unit. In 2008, it was awarded the famous trademark certificate of Tianjin. In 2010, the company obtained the certificate of safety mark of mine products. It is the only steel strand production enterprise with this certificate in the country. Chunpeng brand prestressed stranded wire and steel wire series products have passed the quality inspection of the Ministry of Metallurgy, Coal Center, Ministry of Railways and National Inspection Center respectively. At present, there are 7 lines of low relaxation prestressed strand production line, 2 unbonded strand production line, 1 low relaxation prestressed steel wire production line and 13 sets of drawing machine. 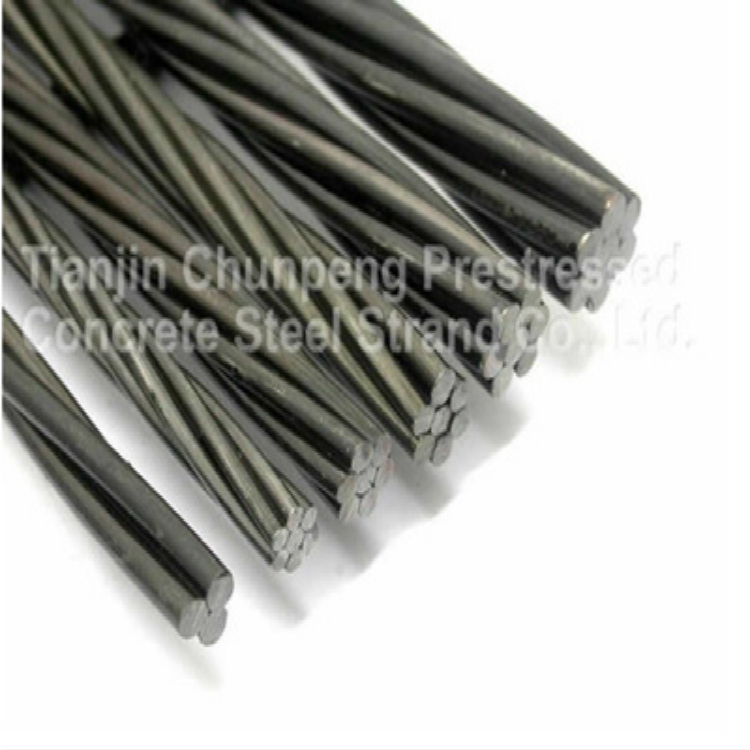 The main specifications are 4.85-23mm strand for prestressed concrete, 4.8-9.0mm strand for prestressed concrete and various specifications of unbonded strand. All the technical indicators of the products meet the relevant national and international standards. The production capacity of low relaxation prestressed steel strand is 200 thousand tons, all kinds of inspection equipment are complete. It can test all kinds of steel strand and steel wire. Good monitoring means ensure good quality and stable performance of the product. In 2009, our company invested in the construction of Chongqing Chun Peng prestressed steel strand Co., Ltd. in Jiangjin District of Chongqing city. The company produces 100 thousand tons of steel strand for various specifications of prestressed concrete, the increase of production capacity, strong guarantee of the supply capacity of the market, meet the needs of customers and better serve the customers. The products of the company are widely used in North China, East China, West China, central China, Southern China, Central Plains, northeast, southwest, northwest and other provinces and cities, such as Luqiao construction, mining support and high-rise buildings. And exported to Asia, Europe, Africa, the Americas, Oceania and more than 60 countries and regions, product quality by domestic and foreign customers alike. All employees of Chun Peng company welcome customers from home and abroad to visit us and discuss cooperation.